'PARADISE IN MEXICO!' or so says our daughter and only a 3 easy block walk downhill to the Jardin . This home works for 2 persons who love the space, light, the different areas outside to relax in, up to 8 people who will also have enough personal space within our home. Our easily large accessible roof is great in the mornings and evenings, the garden with the bountiful lime tree is wonderful all day long, and sitting on a bench outside your bedroom just enjoying flowers is lovely. From the moment I open the door to our house which I share with my husband and family, I feel centered. Our home is about joy, light, and color. It is located just 3 blocks from the center of San Miguel, uphill from the cathedral, jardin and market with wonderful views of the city. We have 5 bedrooms on the entry level floor, 4 with queen size beds and 1 with 2 twins, sometimes used as an extra living room. The bedrooms open directly to the patio (no corridors) in the true Mexican tradition and thus provide privacy for each room. Between the master bedroom and another bedroom there is a split bathroom, one room with a toilet and lavatory, the other a tub shower and lavatory. The second bathroom, quite large, has its access from the courtyard and contains a large shower along with toilet and lavatory. The stars at night are huge and an added treat if you go to the bathroom in the night. When looking at the entry photo, note that the bedrooms and bathrooms are all to the left while the living room, dining room, kitchen, and pantry are to the right. Twenty eight years ago when we first saw this house, occupied by the refrigerator repairman, there was a giant sow nursing her piglets in what is now our laundry space. Fortunately we also saw that the plan and light orientation were perfect. When we came back for the closing several months later, the ceilings that had been propped up by wood poles at the corners, were now on the floor of each room. A year later, with a lot of rubble removed, our house was somewhat ready. My husband, an architect who built schools in Columbia during his Peace Corps years, along with myself, put the house back together, nurtured the existing trees, planted more bougainvillea and a garden, added skylights to each colorful room and decorated with simple furniture and textiles from Mexico. After our first vacation where I had to cook, we hired Juana, who is a fabulous cook of typical Mexican comidas, a wonderful vegetarian cook (our proclivities), keeper of the house and a wonderful spirit who will listen patiently to bad Spanish (mine) or anybody willing to try. There is a fountain, a large and venerable olive tree, table and chairs for eating in the patio. From there stairs lead up half a level to a garden with a fruitful lime tree, a patch of grass for sunbathing or reading, as well as a table and chairs. You may also get to the garden by a meandering garden ramp for anyone who doesn't do stairs. From the garden there are a few more stairs and a ramp to an upstairs bedroom/sitting room and a very large flat roof. Our daughter when younger, would roller skate there but not before 9 a.m. Here is a good view of the street activity and over the roof tops of town and at dusk, the birds fly in overhead to find their evening rest. Then about margarita sipping time come the brilliant sunsets and night sky. Often the cathedral is lighted at night as well as a number of the many other churches of San Miguel. My favorite thing to do is watch the light in the morning which first freshens and warms, flattens at midday, intensifies in the afternoon, and backlights toward dusk. This house is just wonderful. It is only three blocks to the Jardin in the center of town, or to the main market, an easy walk. While shopping is fun, looking at the old buildings the shops are housed in is also fascinating. Many of these buildings are 400 years old. There is a lot of musical events to choose from with the Chamber Music Festival the first 10 days of August, The Cervantes Festival in nearby Guanajuato in the Fall and jazz and jazz guitar performances at restaurants and the Angela Peralta theater one block from the Jardin. You can also find local theater and flamenco performances. San Miguel has many new cultural festivals. Check the website Portal San Miguel for information. Keywords: Traditional Mexican home with the touches of an architect and colorist. We fell in love with San Miguel on our honeymoon and returned to study at the Instituto. We returned regularly and John was part of the architecture and planning team for Los Balcones. We are happy that many years later burros still come by our street with their owners carrying wood and garden manure for sale. The fountain at the end of our street seems to be a good resting spot for the burrors and their owners. When we first were looking for property, we wanted to be in the el centro area, an easy wish at the time as San Miguel had not grown so very much. We also did not want to go any higher on a street than we could push a wheelchair as our son was born with cerebral palsy. So when people ask us about the walk up 3 blocks, I tell them that up until our son turned 24, we pushed a wheelchair up to the house. My husband, an architect, first looked at the direction of the light and visited the house at different times during the day to see how the light played in the house and garden. The light is wonderful! For us, the benefit is just being there in the heart of San Miguel and in our home which is so visually pleasing to us. Whether we are just sitting around on the black and white tiled entry benches with a geranium on either side having a coffee, or in the garden with our lime tree and flowers intertwined in trees, or up on the roof, we just seem to be happy there. I feel centered. The house also flows with the early morning light to nightfall; being outside in the house is what the house is about. At night, the roof is an incredible place to overlook the sparkle of San Miguel, and the stars. Then we all go into the dining room and living room... all connected space to talk or play Scrabble or other games. Then it feels cozy. The kitchen for Margaritas and leftovers from the usual wonderful lunch prepared by Juana, our cook, is adjacent. We have a wonderful cook who comes with the rental of the house, which is a real vacation from cooking for us and watching her all so many lessons in Mexican cooking. San Miguel is just outside our doors, 5 minutes downhill is el centro with restaurants and just sitting in the Jardin watching San Miguel go by. 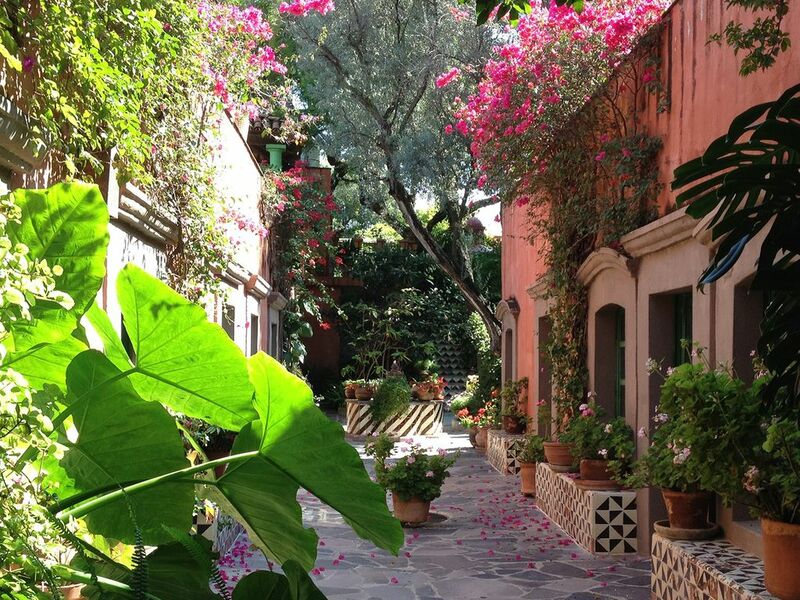 Our home is 3 blocks from the exact center of San Miguel and 4 blocks from the market. It is perfectly situated. You can see the mountains between San Miguel and Guanajuato in the distance. there is a gas heater. We need to give you specific directions for use in the living room. We have a cook for for the comida (lunch) at 2:30. You buy the groceries, she cooks a fabulous meal. Please include enough lunch for her which adds maybe $50cents/day to your budget. lots of mysteries. people take and leave paper back books. We have a small lawn in our lovely garden along with our ever bearing lime tree. nearby, you can join the gulf club as a temporary tourist. This house is best suited for manual wheelchairs, rather than power chairs. We have a ramp all the way to our roof, designed for our son who uses a wheelchair. Please call the owners for more details. Our cook Juana Chavez, cooks the mid day comida meal for you. the renter shops for the groceries at the markets. You can pay her extra if you wish her to cook for a party. Although our initial reaction was to the very lovely courtyard, the plantings, the colors of the rooms, and the liveliness of the folk art collection, we very quickly realized that two of the four heaters we were promised had not been installed. We improvised with two portable electric heaters while waiting for the job to be completed. In the meantime we were distracted by the fact that there was barely enough warm water for two people to shower. Over the course of our stay we had to have the water problem corrected three times and it was never totally adequate. It also turned out that the construction on the abutting house, which had been only obliquely referred to before we arrived, became an ever more pressing problem. By the end of the first ten days the pounding on the wall had become louder and louder and drilling in addition to the pounding had became a major issue. We informed the owner about the situation to which she only replied something to the effect that "it wasn't so bad when I was there". During the last two weeks of our stay we were unable to use our bedrooms after 8:00 in the morning. Frankly we were disappointed that the owner was so dismissive. There were many other inconveniences such as the lack of heat in the bathrooms, no place to dispose of the garbage in the kitchen itself and other things we might be inclined to overlook had the owner been less defensive and more sympathetic. Only at the very end of our stay did her tone change. As Homeaway owners ourselves, we can not imagine not having been much more proactive on our own to see that issues were adequate addressed. We also can not imagine having dismissed the discomfort of our guests in such an offhand manner. These renters have a right to their review. There were 3 issues. The construction issue next door. Normally in San Miguel there can be heard intermittent rat ta ta tat and Mexican music from construction crew radios, modulated if you ask. This was different. When I was there is early November, there was some early morning pounding, annoying but not continuous. But in January, the crew of the architect/owners who were not in San Miguel, began the deconstruction of concrete stairs leading from the first floor to the second, adjacent to our wall. Not until I spoke with them in early February did I learn of the cause of this horrific pounding. My husband and I had no control over it, the owners did not contact us ahead of time ( they did have our contact information) and they were not going to stop deconstruction anyway. So it was horrible. In the Fall, we decided to update all our heaters with the best rated heaters available in San Miguel and I worked with our excellent management company to make sure all 4 would be installed by January 1. I was advised in December the first two were installed and that the second two were in the process as there were gas lines to be dealt with. Turns out, the second heaters were installed in the wrong rooms. These renters had concerns before arriving so on about day 13 of their stay I contacted them to see how their stay was going. Only then was I informed of the heater issue which our management company fixed within 6 hours. Then about a week later we heard about the limited hot water. It was checked and it turned out the heater was not set to the highest heat. It was reset but again did not continue to deliver. Again it was reset but we ordered a new hot water heater to be purchased and installed which was done quickly, but now at the end of these renters’ stay. Normally I get to know our renters by phone, feel responsible for their stay and consider them stewards of our very personal home. Knowing ahead that January would be a horrible deconstruction time, I would not have rented the house and asked the architects for some kind of reimbursement for ruining this most popular month. But this scenario is a dream with unknowns about the schedule and type of work and the owners you are dealing with. From mid March to mid April, we have no renters, the owners saying by then quieter, with finishing work. Our future renters were advised and will be again advised. This is our 4th visit to this property and we adore it! The location is ideal. The gardens, colors and rooftop are super for relaxing and sharing great moments.. Rhe heaters have been upgraded and additional down comforters are in place making the cold winter nights so much more pleasant 😁 Thank you Margaret and Juana. Of course speaking of Juana, she creates the perfect atmosphere. She is the heart of this home in many ways! We love her. All in all a wonderful stay as always! Thank you Ric. The months of December and January can be cold at night and most homes are heated by heaters. These old colonial homes have thick walls and built 100 to 300 years before central heating. During the day you layer your clothes and enjoy the sun without snow or ice. Afternoons are warm in our garden and rooftop. Remember that you are in the mountains. These renters were our test for our updated heaters, additional quilts along with plenty of blankets and throws on the beds that can be taken to the roof for star gazing at night. The hottest month of the year is May when from 1-4 p.m. you want to be in the shade. My husband and I loved this beautiful home and can't recommend it highly enough. It's clean, well-tended and in a central but quiet location. A private oasis. Juana, the cook, is a real gem and prepared delicious, traditional Mexican lunches for us. Thank you for the memorable stay! Thank you Christine for your review. If homes can have two centers, Juana, our cook is one whose heart spreads over the house, the other, the traditional layout of the house and courtyards with the sun rising behind us in the morning and setting on the west facing roof patio looking over the mountains. There are many lovely and fantastic homes in San Miguel, many can be seen on the Sunday Home tours sponsored by the library, but few of those are for rent. We enjoy renting and sharing our home and say thank you because without you, our wonderful and appreciative renters we could never have such a beautiful home to share. Beautiful and welcoming home; convenient to everything walkable; delicious food by housekeeper! Paradise in the center of San Muguel. A romantic, beautiful, more traditional Mexican paradise in the historic center. It is the second time i have spent a month here and i adore both the home and the wonderful person , Juana who is an integral part of the home and the experience! I will be back again! Pictures don't do justice to this lovely property. We were a party of six. The bedrooms were spacious, quite and comfortable. We loved the expanse of this property. We spent a lot of time on the roof top enjoying the view and sipping on Margaritas. Juana showed us the secret of making lemonade part! The location of the house is great. It is just a short walk to great coffee shops, restaurants, and shopping. We enjoyed our mid afternoon meals prepared by Juana. She is a lovely, kind and patient person. Her son takes very good care of the garden. It is a very peaceful place. Margaret, the owner, was very helpful and thoughtful throughout the process of renting. She went out of her way with a a very kind invitation to extend our stay when she thought we may not be able to make it on time for our reserved dates due to the earthquake in Mexico City. Our entire party would recommend this property. Many thanks Margaret and John! Lynda and Peter traveled a long way to enjoy San Miguel so when they had a few rain showers during their stay as September is the rainy season, I was happy to hear them say that playing a bit of Scrabble on the covered roof area worked for them. The upstairs bedroom, adjacent to the roof, is also a great rainy day place as it looks out through two doors , one single glass and the other double glass doors to beautiful views. It is a comfortable hideaway for a snooze or to read. Lynda and Peter, thanks for the review so others may know more about the house.